Martin Sorrell and Victor Knaap offered lots of clues about S4 Capital’s future when they spoke at Campaign’s exclusive Breakfast Briefing event. Sorrell, the S4 Capital executive chairman, and Knaap, chief executive of content production company MediaMonks, said moving into digital media planning and buying, particularly performance marketing, is a priority. Sorrell said S4 Capital, which he founded in May, will help clients if they want to bring some services "in-house" and it is essential that all parts of the group function as a "unitary" company, rather than being separate units, in contrast to how he ran WPP from 1985 until April 2018. Knaap said clients need to start by thinking about creating always-on, personalized content and a better customer experience, rather than a "big idea" and 30-second TV spots. These were the highlights of the discussion about S4 Capital at Campaign’s Breakfast Briefing, "Back to the Future: When Sorrell Met MediaMonks," in association with Results International at Curzon Soho in London. Knaap said: "If you look at creative spend and media spend, our true belief is you have to fix the personalized, always-on layer first." He maintained that too many "big agency RFIs are around the big idea," although he insisted, "It’s not that I don’t respect the big idea." "The reality is, to run a brand machine and to do brand-building and do [sales] conversion in one go and to run ecommerce, you have to fix that [always-on] layer," he said. "You can’t start with [traditional] 60-second or 30-second ads. One of the things that you aren’t allowed to say in our company is ‘cut down’," Knapp added, explaining that six- or 10-second ads should be created in their own right, not cut down from a longer film as an afterthought. "Who said you should ‘cut it down’?" Sorrell added that brands want fewer "big set pieces" and "in-between, there is a lot of work" creating always-on content. "It has to better, faster, and – I won’t use the word 'cheaper' – it has to be efficient," Sorrell said. "Agencies probably haven’t responded fast enough." Newer agency organizations such as MediaMonks are "very different" with "different structures," according to Sorrell, who explained they are "much slimmer and leaner" for an "always-on environment." "The nearest equivalent to my mind is a political campaign," he said. "They [brands] must be much quicker and much more proactive and reactive." Knaap, whose company talked to a number of consulting giants during the sale process, said, "I do believe that in the end what a lot of the consultancies and agencies forget is it’s about user interaction, it’s about customer experience." "What we try to do is build a company up from there," he added. "We know and make interactions that people actually do. We understand how you need to create content across all these different screens that people interact with." Sorrell said "our first move" in media buying is likely to be an acquisition in the digital and programmatic space – "that’s where the biggest opportunity is." Knaap said the acquisition will "probably" be a more "performance-based" agency, although "our true belief is there is no difference between brand-building and performance." "Scale is important," he conceded, but he suggested "you can make entries at reasonable cost" in the digital and programmatic world, adding, "It won’t get you the scale of Publicis or WPP, but it will get you in." Sorrell recalled how Buffett invested in listed companies such as Interpublic Group and Ogilvy in the 1980s because he regarded them as "royalties on the growth of U.S. companies." "What S4 Capital is is a royalty on the growth of the major platforms" such as Google, Facebook, Amazon, Apple, Microsoft, Tencent, and Alibaba, which are all increasing revenues at a rapid rate, Sorrell explained. He pointed out MediaMonks’ recent revenue growth compares favorably with Facebook’s latest quarterly growth of 33%. Sorrell said that during M&A talks with potential target companies, "it’s been really critically important that they are prepared to accept complete unity." If S4 Capital acquires a media agency, its leaders will likely join the board alongside Sorrell, Knaap, MediaMonks cofounder Wesley ter Haar, and a couple of non-executive directors. S4 Capital will not run its companies "as separate units" and it will be "very different" from WPP, according to Sorrell. Each company at WPP has "its own budgets" and "its own incentive systems," he pointed out. Sorrell believes the direction of travel for all agencies is towards a unitary model. "All six holding companies are moving to be one firm," he said, referring to WPP, Publicis Groupe, Omnicom Group, Interpublic, Dentsu, and Havas. 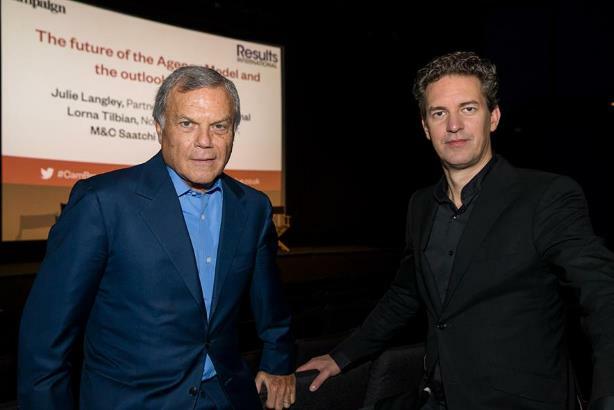 "We care about agency brands," Sorrell said, referring to people working inside the ad industry, but he suggested that they needed to look forward, rather than "in the rearview mirror." His only caveat was that he felt Publicis has been "moving too fast" and "destroying brands." Omnicom stands at the other end of spectrum, while Dentsu is "probably best positioned" with its mix of media, data, and digital, according to Sorrell. He conceded that he has changed his tune since his days running WPP, when the group had many individual units and P&Ls, but he noted, "Consistency is the hobgoblin of small-mindedness." That said, he warned, "Philosophically, it’s very different for clients [to organize themselves in-house] to keep up to date and maintain talent." "The big question is: what’s the proportion of what’s in-house [and what’s left to the external agency]?" he asked. Knaap added that he does not expect MediaMonks to embed a lot of staff in clients’ offices, saying, "I don’t believe in the model that you have to shift all your model inside the client premises." He added that MediaMonks' staff likes working together. For example, junior designers learning from a senior designer, and on a range of different brands. Sorrell has previously said S4 Capital began as a "peanut" and became a "coconut." Now he describes the group as like a coco de mer, an immense nut that grows on a palm tree. While he admitted "I miss the scale" of WPP, he said of S4 Capital, "I think we can get sufficient scale." Sorrell hopes the business can more than double from its current size in the near future. "I’d like to see the company at around $300 million of revenue and $40 million to $50 million of Ebitda in fairly quick time," he said. However, Sorrell, who grew WPP from virtually nothing to £24 billion in 30 years, wouldn’t be drawn on how much S4 Capital might grow. "It would be very dangerous to respond to that – other than to say the three areas we’re focused on are content, media planning, and buying and data," Sorrell said. James Thompson, the new chief beauty and brand officer of Avon and former CMO of Diageo North America, who also spoke later at the breakfast, said he felt "most clients have been experimenting for some time" with their marketing and agency models. He said S4 Capital’s one P&L operating model is "encouraging," but he raised questions about an "always-on" strategy, which he found as a CMO was "very effective" but only "got us so far."